The Global Vegetarian Kitchen offers more than the traditional on a worldwide scale. 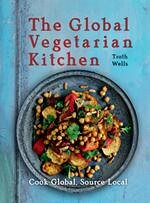 From Spanish Gazpacho to Korean Bibimbap and Australian Pavlova, The Global Vegetarian Kitchen features outstanding full-colour photographs, which accompany more than 100 easy, appetizing recipes for vegetarians, vegans and those who just enjoy good food. Whether you grow your own food, source fair trade or buy local, this cookbook starts where you are, offering tips to source local and cook global. It's time to take your tastebuds traveling. 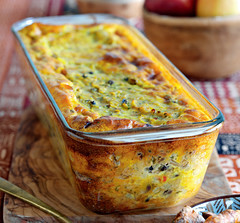 This is a traditional South African recipe, adapted from its meat- based origins. The name of this popular South African dish probably comes from the Indonesian word bobotek. It is likely that the recipe traveled from the Dutch East Indies (now Indonesia). It has a varied heritage: the Dutch brought ground meat to the local cuisine, the spices were introduced by the slaves from Indonesia and the presentation is reminiscent of English shepherd's pie. But, in my experience, it's more eaten at home than served in restaurants - which is a pity. 1 First, soak the bread in the milk for about 20-30 minutes, until the milk is fully absorbed and the bread is really soft. When ready, with clean hand, squeeze the bread to release some of the milk (retain this milk). 2 While the bread is soaking, heat the fat in a saucepan and then cook the onions until soft. Next, put in the garlic, ginger, chili, garam masala, ground cumin, ground coriander, cloves, allspice and cinnamon stick and stir; fry for a couple of minutes. 3 Add water, apricots and sultanas or raisins, apple and lentils and cook for some 20 minutes until the lentils are soft. Leave to cool a little. 4 While cooking, mix the soaked bread with the egg, parsley, bay leaves and the beans. Add this to the lentil mix and squash with your clean hand so the beans are partly, but not fully, mashed. This should make a moist but not watery mix. 5 Put into a baking dish and smooth the top with a spoon. 6 Now, for the topping, mix the egg, with the retained milk from the soaked bread, adding more milk as necessary to make about 1 cup/240 ml. Mix in the turmeric, cinnamon and salt; stir well. Pour this topping over the bean and lentil mix and put it in the oven. 7 Bake for 40-50 minutes or until the topping has set and is golden brown. Serve with yellow rice with raisins (easy to make by adding a little turmeric while cooking), and 'sambals' such as diced cucumber and yogurt (raita), dried coconut, chutneys or apricot jam, sliced tomatoes in a little vinegar with chopped chives or spring onions on top, chopped parsley, and sliced bananas.